Two NFL teams coming off of disappointing seasons met in San Francisco on September 13, 1964 to open another year amid expectations for improvement. 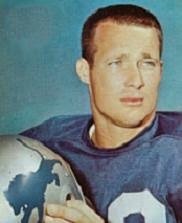 The Detroit Lions, a perennially tough defensive team, suffered through an injury-plagued ’63 campaign in which they went 5-8-1, their first losing record after three consecutive second place finishes in the NFL Western Conference. Coached by George Wilson, they were anticipating the return of DE Darris McCord and DB Gary Lowe, who all underwent offseason surgery, plus DT Alex Karras, who was reinstated by the league following a gambling suspension. QB Milt Plum had regained the starting job in the preseason that he lost to Earl Morrall the previous year and there were outstanding receivers in flanker Terry Barr and split end Gail Cogdill. The 49ers were a dismal 2-12 in 1963, putting them in last place for the first time in franchise history. Red Hickey was replaced by Jack Christiansen as head coach during the season, and Christiansen was starting off his first full year at the helm. 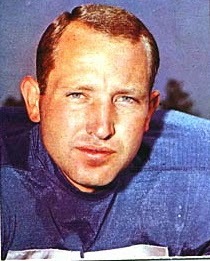 He had QB John Brodie back and recovered from a broken arm that had sidelined him for most of ‘63. The offense had suffered to the point that CB Abe Woodson, the NFL’s top kickoff returner, was looked upon as the most effective ground-gaining weapon. Injuries had also hampered the defense, and improvement was anticipated on that side of the ball as well. It was a cool, overcast day at Kezar Stadium with 33,204 in attendance. The 49ers went three-and-out on the game’s opening series and punted. Detroit put together a 10-play, 58-yard possession, with the biggest gain on a pass from Milt Plum to Gail Cogdill for 34 yards to the San Francisco 34 in a third-and-14 situation. Plum connected with Cogdill twice more for 16 yards and the series finally ended with Wayne Walker (pictured above) kicking a 23-yard field goal. The home team responded by going 80 yards in six plays. On second-and-19 from their own 37, the 49ers made a big play when John Brodie threw to flanker Bernie Casey, who made an outstanding catch at the Detroit 30 and went the distance for a 63-yard touchdown. 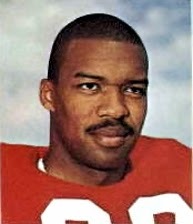 Tommy Davis added his NFL-record 157th consecutive extra point and the Niners were ahead by 7-3. The teams traded punts to finish out the first quarter. Starting off the second quarter, Plum threw to Terry Barr for a gain of 47 yards to the San Francisco 11, but after a short run by HB Tom Watkins, two passes fell incomplete and Walker came in to kick another field goal, this time from 16 yards. A short series by the 49ers was followed by another scoring drive by the Lions, this time covering 47 yards in eight plays. Plum had a nine-yard pass to Cogdill and FB Nick Pietrosante and HB Dan Lewis ran effectively, with Pietrosante diving into the end zone from three yards out for a TD. Walker added the PAT and the visitors were ahead by 13-7. Detroit had good starting field position at the San Francisco 43 following a punt but Plum threw an interception. However, after another punt by the Niners that had the Lions starting at their 15, the visitors drove to another score. Plum had another big completion to Cogdill (pictured below) on a third down play, this time for 43 yards to the San Francisco 38, and three carries by Lewis gave the Lions another first down. The drive stalled at the 23 and Walker booted his third field goal of the game, this time from 31 yards with less than a minute remaining in the half. The 49ers made a bid for points in the final seconds as Brodie threw to TE Monte Stickles for 19 yards and then to Casey for 24, but Davis missed a 39-yard field goal attempt. The Lions carried a 16-7 lead into halftime. Detroit started off the third quarter with a 74-yard, 11-play series. Watkins ran for 15 yards on a reverse, Plum connected with Barr for 39 yards, and Pietrosante capped the drive by plunging for the last yard and a TD. Walker again added the extra point to make the score 23-7. Now behind by 16 points, the 49ers got a boost when DB Kermit Alexander returned the ensuing kickoff 44 yards to give them good starting field position at the Detroit 40. The Niners picked up just six yards, but Davis kicked a 41-yard field goal to narrow the margin to 23-10. The Lions had to punt on their next series and Yale Lary’s short kick had the 49ers taking over at the Detroit 38. FB J.D. Smith ran for 16 yards and, three plays later, Brodie threw to Stickles for 10 yards in a third-and-eight situation. Casey caught a Brodie pass for a seven-yard touchdown and, with Davis converting, it was suddenly just a six-point game. The Lions again had to kick the ball away following a short possession and the 49ers were driving as the game moved into the fourth quarter. However, they came up empty when Davis missed a 38-yard field goal try. Plum threw to Barr for 23 yards but, following a run by Lewis that lost yardage and a 15-yard penalty that moved the visitors back, Detroit again had to punt, although a clip nullified a good return by Alexander. Mired deep in their own territory, the 49ers turned the ball over when Brodie fumbled and DE Darris McCord recovered at the five yard line. A penalty moved the Lions back and they again had to settle for a field goal, but Walker was successful once more, hitting from 26 yards out. Detroit was up by nine points. That was it for the scoring. Alexander had a 38-yard kickoff return, but the 49ers went three-and-out and had to punt and the Lions managed to control the ball until the closing seconds. They came away the winners by a score of 26-17. Detroit led in total yards (372 to 219) and first downs (17 to 13). The Lions also recorded two sacks, to none by San Francisco, although they also were penalized 10 times, at a cost of 80 yards, to four flags thrown on the 49ers. Each team turned the ball over once. Milt Plum completed 15 of 34 passes for 234 yards and no touchdowns while giving up one interception. Two Lions had over a hundred receiving yards, with Gail Cogdill catching 6 passes for 116 yards and Terry Barr adding 108 yards on his three receptions. Dan Lewis ran for 83 yards on 17 carries and while Nick Pietrosante picked up just 36 yards on 12 attempts, two were good for short TDs. Wayne Walker was the scoring star with 14 points on his four field goals in as many attempts (which set a club record) and two extra points. For the 49ers, John Brodie was successful on 15 of his 33 throws for 177 yards and two TDs with no interceptions. Bernie Casey (pictured at right) had 6 catches for 119 yards and two scores. J.D. Smith ran for 42 yards on 11 carries. Kermit Alexander had 107 yards on kick returns (82 on two kickoffs and 25 on two punts), overshadowing Abe Woodson, at least for one week. Detroit got off to a 4-1-1 start before injuries set in and the team finished up at 7-5-2 and in at fourth place in the Western Conference. It was improvement, but not enough to save Coach Wilson’s job. The 49ers won the next week at Philadelphia but went on to another losing year and a final record of 4-10, which resulted in a second straight last place finish in the conference. While the passing game was better, injuries decimated the ground attack. Wayne Walker, an outstanding linebacker as well as placekicker, ended up booting a career-high 14 field goals out of 25 attempts and, adding 32 extra points, achieved another career best with 74 points. Terry Barr and Gail Cogdill remained productive, with Barr catching 57 passes for 1070 yards (18.1 avg.) and nine touchdowns and gaining selection to the Pro Bowl for the second consecutive year, and Cogdill accumulating 45 receptions for 665 yards (14.8 avg.) and two TDs before a shoulder injury sidelined him late in the year. Bernie Casey continued to be a key performer for the 49ers, catching 58 passes for 808 yards (13.9 avg.) and four touchdowns. Kermit Alexander had a fine year returning kicks, averaging 24.2 yards on 20 kickoff returns (Abe Woodson had a 27.5 average on 32 returns) and 9.0 yards on 21 punt returns that included a TD.